The world's richest man announced the move in a tweet, saying the charity would be called the Day One Fund. And US Senator Bernie Sanders has criticised working conditions in Amazon warehouses. Mr Bezos asked on Twitter last year for suggestions on how he might use his personal fortune, which this year has soared due to Amazon's surging share price and US tax cuts. The fund will be split between Day 1 Families Fund and Day 1 Academies Fund. "The Day 1 Families Fund will issue annual leadership awards to organizations and civic groups doing compassionate, needle-moving work to provide shelter and hunger support to address the immediate needs of young families," Mr Bezos said in a tweet. The Day 1 Academies Fund will launch and operate a network of high-quality, full-scholarship, Montessori-inspired pre-schools in low-income and underserved communities, he said. "We will build an organization to directly operate these schools," he added. Earlier this month Amazon, which Mr Bezos founded in 1994, became only the second stock market company to be valued at $1tn. Apple reached that milestone a few weeks earlier. Despite the huge amount of money being given, it is far less than the philanthropy of other billionaires such as Microsoft's Bill Gates, who has donated tens of billions to his foundation, and Facebook's Mark Zuckerberg, who has pledged to donate 99% of his shares in the social media giant to an organization focused on public good. The $2bn also falls short of the "giving pledge" initiative launched by Mr Gates and billionaire investor Warren Buffett, who have encouraged wealthy individuals to pledge half their fortunes for philanthropy. 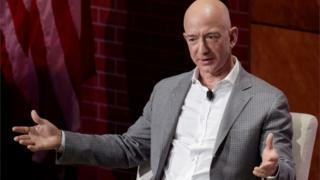 Mr Bezos, who operates the Blue Origin space rocket project and who owns the Washington Post newspaper, has given donations to a scheme to help the children of immigrants, cancer research, and Princeton University.